Christianity is a historical religion. The Bible makes claims about events that happened in real time and space that can be evaluated in light of the historical and archaeological records. If the events of the Bible truly happened, then one would expect the surviving evidence to lend support to the biblical record. If not, then we would naturally expect the evidence to contradict it. Over the last two centuries, the Bible has fared incredibly well. Mormonism also makes a number of historical claims. Like the claims of the Old and New Testaments, the Mormon scriptures can be checked against the historical and archaeological records. The Book of Mormon and other Mormon scriptures have not fared well at all. The dearth of evidence has made things increasingly difficult for Mormon apologists. Scholars within the Mormon community have recognized the difficulties presented by the archaeological record. Michael Coe, professor emeritus at Yale University and one of America’s foremost experts on the Mayan civilization, says, “What has gone wrong, therefore, with Mormon archaeology?… Mormon intellectuals, it seems to me, have taken three ways to extract themselves from the dilemma,” noting, “The third way out of the dilemma is apostasy. I will not dwell further on this painful subject, but merely point out that many unusually gifted scholars whom I count as friends have taken exactly this route” (Coe 1973, pp. 46-47). Scholars such as William Ramsay and William Foxwell Albright began as skeptics of the Bible and later became convinced by the evidence that the Bible was true. It would appear that the opposite is the case for many scholars who have difficulty reconciling the claims of the Mormon scriptures with the paucity of evidence in the archaeological record. Of all the sacred texts of the Mormon church, one of the most fascinating is the Book of Abraham, a five-chapter book that purportedly records the travels of Abraham in Egypt. According to Joseph Smith’s introductory comments in the translation, Abraham wrote the book himself, “by his own hand, upon papyrus” (Smith, 1842, 3:704). The book tells a story of Abraham’s capture and near-sacrifice by an evil Egyptian priest. It also portrays the patriarch as lecturing the pharaoh in astronomy. In the 1800s, ancient papyrus documents emerged that were quickly purchased by the budding Mormon church. Smith, eagerly seeking historical evidence, claimed these documents were part of the Book of Abraham, which would in time become canonized as part of the Mormon scriptures. These documents were later lost, only to resurface in the 1900s to be examined by scholars. Egyptologists who have examined these papyrus fragments understand them to be parts of the Egyptian Book of the Dead, a tome of spells to aid the deceased in the afterlife. This corpus of material began as the Pyramid Texts, which were inscribed inside the pyramids themselves. As pharaohs abandoned pyramid building in favor of tombs, Egyptians inscribed these texts on coffins, which were then called the Coffin Texts. Finally, this material was written on scrolls, later known as the Egyptian Book of the Dead. This work was illustrated by scribes in the ancient world, and three such illustrations (known as Facsimiles 1, 2, and 3) were found among the papyrus documents Smith purchased. Facsimile 1 supposedly depicts the scene of Abraham nearly being sacrificed by the Egyptian priest Elkenah. Since Joseph Smith knew virtually nothing about Egyptian religion, he misidentified everything in the scene. Following is the list of Smith’s proposed identifications, as well as their true identification (The facsimiles and the suggested identifications may also be found on the LDS Web site: http://lds.org/scriptures/pgp/abr/fac-1?lang=eng). “The Angel of the Lord.” This winged figure is not an angel but the ba, or the soul of the deceased. It was depicted in Egyptian art as a bird-like figure with a human head that hovered near the body of its owner. Angels in the Bible are heavenly beings (the Hebrew term mal’ach means “messenger”), not disembodied human souls. The original papyrus is fragmentary, and the original head of the bird is missing. It was restored (presumably by Smith himself) as the head of a bird, but almost certainly had the head of a human originally. “Abraham fastened upon the altar.” The figure identified as Abraham is really the body of the deceased who is being mummified. This is a common scene in Egyptian art. 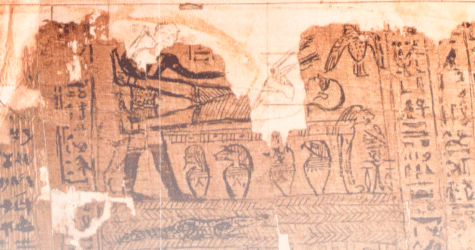 “The idolatrous priest Elkenah attempting to offer up Abraham as a sacrifice.” What the picture does not reveal is that in the original papyrus document, the head of the standing figure is missing, as is the hand of the arm that is extended over the body. These were drawn in at a later date. In the original document, it is absolutely certain that the head of the standing figure was that of a jackal, which would belong to Anubis, the god of mummification. The knife in the hand was also added. In pictures like this from Egypt, the hand is empty. Someone supplied the knife in the drawing, which was not there originally. “The altar for sacrifice by the idolatrous priests, standing before the gods Elkenah, Libnah, Mahmackrah, Korash, and Pharaoh.” The “altar” is a structure known as a funerary couch or funerary bed. It was essentially an embalming table. The deceased is often depicted as resting on this structure during the mummification process. In other ancient illustrations the god Osiris is seen lying on the couch. “The idolatrous god of Elkenah.” The items in the picture numbered 5-8 are improperly identified. There are no known gods with the names Smith ascribes. In the Book of Abraham, Smith plainly states that this illustration was included to educate the reader about the Egyptian gods: “That you may have an understanding of these gods, I have given you the fashion of them in the figures at the beginning” (Book of Abraham, 1:14). Unfortunately, many Mormon believers may be completely unaware that this is pure invention. These are not idols of gods, but rather funerary items known as canopic jars (some might object here, saying that Smith’s identification is accurate, since the jars depict Egyptian gods. The problem is that the word “god” in Scripture, unless it refers to the God of the Bible, is often synonymous with “idol.”). These jars, often made of alabaster, held specific internal organs that had been removed from the body of the deceased during the mummification process. The heads on the tops of the jars each represent one of the four sons of Horus. All four of the names Smith assigns are incorrect. No one with any familiarity with either Egyptian or Hebrew would have used these names—because they belong to neither language. The figure depicted on the first jar is the god Qebehsenuef. This jar contained the intestines of the deceased. “The idolatrous god of Libnah.” This jar is topped with the head of a jackal, representing the god Duamutef. It contained the stomach. “The idolatrous god of Mahkackrah.” This jar is topped with the head of a baboon, representing the god Hapi. It contained the lungs. “The idolatrous god of Korash.” This is the human-headed jar, representing Imseti. This jar contained the liver. “Abraham in Egypt.” Again, this is the body of the deceased person being mummified, not the captive patriarch. The fact that the figure appears to be clean-shaven is particularly difficult for Mormon apologists. Egyptian men shaved their heads and facial hair, while Semitic peoples did not (cf. Genesis 41:14). Egyptian art, such as that in the Beni Hasan tomb painting (17th century B.C. ), shows Semitic people like Abraham with beards and full heads of hair (the beard with which the pharaohs were depicted was a false one—a close examination of both paintings and sculpture will show the strap along the jaw line designed to hold the beard in place). Shaving the beard was a sign of extreme shame (2 Samuel 10:4) or mourning (cf. Isaiah 7:20) for the Israelites. “Designed to represent the pillars of heaven, as understood by the Egyptians.” Many ancient cultures believed that heaven was supported by pillars. The design in Facsimile 1 seems to be nothing more than artistic ornamentation. The name Smith assigns to these “pillars” is neither Hebrew nor Egyptian. It is another instance of invention on his part. The Egyptian concept of heaven, which they called Aaru (“the field of reeds”), was of reed fields much like those in the Nile delta. Of course, Smith could not have known this, and simply based his guess on what was familiar to him. “Raukeeyang, signifying expanse, or the firmament over our heads; but in this case, in relation to this subject, the Egyptians meant it to signify Shaumau, to be high, or the heavens, answering to the Hebrew word, Shaumahyeem.” Smith says that the “expanse” is analogous to the Hebrew “Shaumahyeem,” which is a badly garbled spelling of the Hebrew word shamayim, meaning “heavens.” Raukeeyang and shaumau are not Egyptian words. Smith’s designations do little more than expose his lack of familiarity with the textual evidence, both biblical and Egyptian. The “Book of Abraham,” it is hardly necessary to say, is a pure fabrication.… Joseph Smith’s interpretation of these cuts is a farrago of nonsense from beginning to end. Egyptian characters can now be read almost as easily as Greek, and five minutes’ study in an Egyptian gallery of any museum should be enough to convince any educated man of the clumsiness of the imposture” (as quoted in Spalding, p. 27). The New York Times even carried a story in the Sunday edition of December 29, 1912, with a headline stating, “Museum Walls Proclaim Fraud of Mormon Prophet” (“Museum Walls…”). Coe, Michael D. (1973), “Mormons and Archaeology: An Outside View,” Dialogue: A Journal of Mormon Thought, Summer, pp. 40-48. Hoffmeier, James K. (1996), Israel in Egypt: The Evidence for the Authenticity of the Exodus Tradition (New York: Oxford University Press). Smith, Joseph Jr. (1842), “Truth Will Prevail,” Times and Seasons, 3, March 1. Spalding, Franklin Spencer (1912), Joseph Smith, Jr., As A Translator (New York: Protestant Episcopal Church National Council). “Museum Walls Proclaim Fraud of Mormon Prophet” (1912), New York Times, 29:1-2, December. “Facsimile I” (no date), http://lds.org/scriptures/pgp/abr/fac-1?lang=eng.